KS Digital ADM10... the perfect mid-field or in-wall studio speakers. The ADM10 is the ultimate all-in-one mid-field / in-wall studio monitor. Featuring (2) 8" low frequency drivers, a 3" dome midrange, and a 1" dome tweeter, this massive powerhouse is the most accurate monitor of its kind, thanks to its built-in Firtec DSP technology. As with the smaller ADM20, the ADM10's Firtec DSP means absolutely ruler-flat frequency response, linear phase alignment, and transparent dynamic reproduction that perfectly matches the signal fed to its input. That's because Firtec DSP corrects for your room using advanced FIR technology, but also for the speaker itself--something no other manufacturer has accomplished. This is the most accurate system ever developed in studio monitoring technology, and it is 100% repeatable and exact between speaker cabinets, no matter when the date of manufacture--so if your stereo system later changes to a surround system, there is no difference in quality between the first speakers or the last. The ADM10 is also a fully integrated monitor control--a KS Digital hardware or software remote can control the entire system, eliminating expensive outboard monitor controllers or digital faders. This system controls the volume of the actual ADM10 amplifiers AFTER digital conversion, meaning you don't sacrifice bit depth or digital dynamic range like on all other manufacturers' systems. This control technology is another industry first from KS Digital, born from the issue that faces every manufacturer--how to control the digital level sent to the speakers in order to provide volume and mute changes. So, the ADM10 is not only the world's most accurate mid-field / in-wall studio monitoring solution, it is also the world's most flexible one! 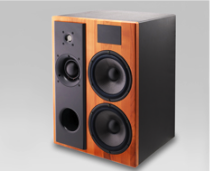 The KS Digital ADM10 is a self-powered, tri-amplified, full-bandwidth 3-way speaker. Driven by 400W / 200W / 150W amplifiers, the ADM10 has an abundance of power to handle the most detailed mixing and studio mastering work. For any genre of music, the broad dynamic range and 25Hz to 24kHz frequency response reveal all the details in your music--even the details you never knew existed. You hear nothing but the actual musical performance as it was intended--no alterations of the signal, no distortions or anomalies... just pure, perfect reproduction. Using advanced FIR technology (hence the name, "FIRtec"), KS Digital accomplishes this DSP miracle differently than any other manufacturer--all of whom use traditional equalization and filters to achieve a flat response, which of course leads to phase issues and compromised dynamic response. Utilizing Firtec is like taking the veil off of traditional speaker and DSP monitor sound design, as it presents the music phase-linear with full dynamic response--no compromises are made whatsoever to output the signal as perfectly as it arrives at the input. At any volume, the ADM10 translates music perfectly. All amplifiers and digital controls are mounted on the back of the ADM10, and everything is controllable via the remote (hardware or software). Since the ADM10 has such a broad frequency response and dynamic range, you get a completely accurate presentation of your music in a "wall of sound" that rivals any competing mid-field studio monitoring systems made today. The Firtec DSP can also be tuned to your room so your studio speakers become even more accurate for your own particular environment--and as your environment changes, the DSP can be updated to match. Take a listen to the ADM10, and hear why it has become the reference monitor of choice for so many studios and independent producer/engineers world-wide. As with all KS Digital studio speakers, the ADM10 is magnetically shielded, and it is hand-built in Germany for you and comes with a signed Certificate of Authenticity, as well as a full 2-year warranty. … Among others, KS Digital revolutionized the first FIR filtered studio reference monitor (the ADM2, now ADM20) on the studio scene with a resolution never experienced before, which was confirmed through many tests by engineers. … If you look at the reference list of KS Digital, you see that these active monitors are not just “any” kind of studio monitors, which quickly became very obvious to me when testing the ADM10. … With the first sound check, right when I got started, I nodded and smiled away… in short, they knock you out. That was the beginning of a series of listening tests, and I had a ball. … I used a master tape on my Telefunken M15A… Beethoven’s 5th Piano Concerto… recorded in 1934/1944 in Berlin in stereo. Even to people who don’t fancy the classical music genre, this recording always creates something magical to the listeners. Through the ADM10’s, this advanced to an experience of the highest league. With a dreamy expression on everyone’s faces, we listened through the entire 37 minutes of recording, without anyone saying a single word, not even the guys who despise classical music. … Regardless of which LP or CD you happen to play, the ADM10 will always give you reliable information in regards to the true sound characteristics of that particular recording. If there are any shortcomings in the sound, they will be exposed precisely. Very good recordings will blow you away, and bad recordings will be identified immediately. … The capacity of the ADM10 to reproduce sound at the highest level of quality is at the limit of what is possible to reproduce sound through speakers…. Don’t bother to even try to find mistakes or weaknesses in this speaker; you won’t be able to in the ADM10. If you have the right sound source, you will only hear music, free of any artifacts. … The ADM10 is the perfect tool for studio professionals, without any weaknesses or compromises, and it fulfills all wishes for home use as well. …With a frequency response from 25 Hz up to 24 kHz, the ADM10 is recommended for larger studio installations, as well as mastering studios that like "to hear the grass grow" (hear almost impossible details). …Johannes Siegler, the President of KS Digital and chief designer, worked for many years in designing the highest standards in studio reference monitors of all categories and sizes, and is respected as a pioneer of innovative digital concepts for speakers. Releasing the ADM10 as a main monitor of medium size in the marketplace is totally convincing, taking design and pricing into consideration. …Within the first few seconds of listening, my thumbs went up. I ran down my usual test programs (which I listened to on plenty of speakers before), and I experienced a razor sharp phantom center. When switching to mono, the stereo folds right into the center in a narrow strip, exactly how you would like to experience it. The smallest details and dynamics are presented with extreme precision and transient response. Especially remarkable was the tonal separation in the lows, which with many other monitors is presented very muddy. Different frequencies in the sub region unfold without any problems, and are very vivid and three-dimensional. …When listening to classical music, you can almost touch the orchestra. You feel the depth of the venue and without hesitation you can locate the position of individual instruments or groups of instruments. A very noticeable aspect was the positioning of sounds in the stereo panorama. In the area of the phantom center, it was remarkably detailed so that even the slightest deviation was detectable as a change of pan direction. The portrayal of the highs, the precise mids, and the effortless image of even the lowest frequencies added to the already positive features of the speakers. The ADM 10 sounds very honest and does not color the sound at all--which, by the way, stays true at any volume. Even at the lowest volume, the ADM10 is fully there. …With the ADM10, KS Digital has produced an excellent tool, which mercilessly presents the quality of a production down to every detail. The mathematical precision of the digital technology here operates at its fullest potential, as the sound of these speakers, their true impulse response, presentation of the stereo panorama, room reproduction, and total balance in tonality are the absolute highest level of quality. …They have earned my highest respect. Such a product of German engineering does not hide behind the international competition--in fact, it is the other way around. Dimensions H 62 x W 45 x D 38 cm, 24.5" x 17 2/3" x 15"